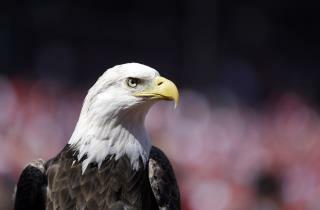 (Newser) – The bald eagle's 234-year reign as the sole symbolic animal of the US is about to come to an end. The National Bison Legacy Act passed by Congress—and expected to pass the Senate next week, per CNN—denotes the bison as America's national mammal and a "historical symbol of the United States," joining the bald eagle as the national animal, the oak as the national tree, and the rose as the national flower, reports the Guardian. Though the move will come with no additional protections for bison, a rep for the Wildlife Conservation Society says it's a "milestone in a long journey … to prevent the bison from going extinct and to recognize the bison's ecological, cultural, historical, and economic importance." It's also fitting since the bison "is as strong as the oak, fearless as the bald eagle, and inspiring as a rose." The bald eagle is a bird. The bison is an animal. Plenty of room for both! Any other animal would be a disgrace to our country. The Bison is a powerful and intelligent creature. Maybe the Bison wasn't the best choice after all. Those two things don't really seem to describe our country anymore. Humans should be the mammal of choice, not buffalo.